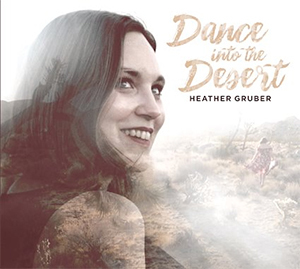 Heather Gruber is an indie folk pop artist who lives in Los Angeles, but she grew in the hills of East Tennessee and it is these roots which lend an authentic country-tinged twang to everything from her voice to her songwriting. Her new album Dance Into The Desert is a fun-filled, optimistic collection of ukulele-driven pop moments—little snapshots that together form something which is ultimately more ambitious than at first glance, and making her stand out as a unique voice in a lineage of singer-songwriters like Regina Spektor and Sara Barielles. Dance Into The Desert is a remarkable debut album which encloses a large amount of craft and attention to detail within a deceivingly modest pop format.